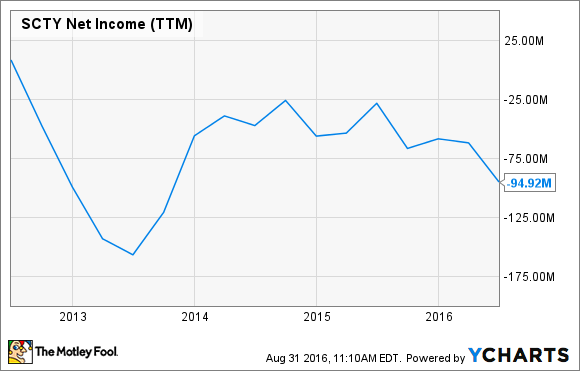 There are some good signs for SolarCity Corp. going forward -- and some bad. SolarCity Corp. (NASDAQ:SCTY.DL) has been through a lot in the last few years. The company has grown to a dominant position in residential solar, and despite that dominance, its stock has dropped, and it's now in the process of being bought by Tesla Motors. That acquisition is far from complete, so investors need to keep an eye on where the solar company is headed right now. These five charts will tell you a great deal. The chart below shows how fast SolarCity has grown over the past five years, and the trend is impressive. One reason the company can grow so much is that revenue from newly installed solar systems is stacked on revenue from older systems. In theory, SolarCity could grow revenue for the foreseeable future because of this dynamic. SCTY Revenue (TTM) data by YCharts. What hasn't happened yet is SolarCity reporting a profit due to this growth. And that's why the next chart is important. You can see below that growth hasn't translated to profitability for SolarCity. This is partly because operating costs aren't totally offset by revenue from solar leases and partly because of investment in growth. But it's also a reminder that growth doesn't necessarily mean a company is highly profitable for investors. SCTY Net Income (TTM) data by YCharts. Maybe solar costs aren't falling? One of the themes of solar over the past decade, and one of the reasons for SolarCity's growth, is that costs are falling rapidly. But recently, results from SolarCity (NASDAQ:SCTY.DL) are starting to show that may not be the case. You can see in the chart below that costs jumped in the first quarter and that even Q2 2016 installation costs are higher than they were two years ago. The major problem is that sales costs are rising, which is something we've seen from competitors like Sunrun as well. But even core installation costs are only down slightly from a year ago. Falling costs may not be the advantage you think they are for SolarCity, and if costs keep rising, investors should be concerned. One of the red flags I watch for in the solar industry is the rising cost of debt. If debt costs rise, it means a company is less competitive in renewable energy, and if a company is in need of constant sources of funding, as SolarCity is, rising debt costs can lead to a downward spiral (see SunEdison). 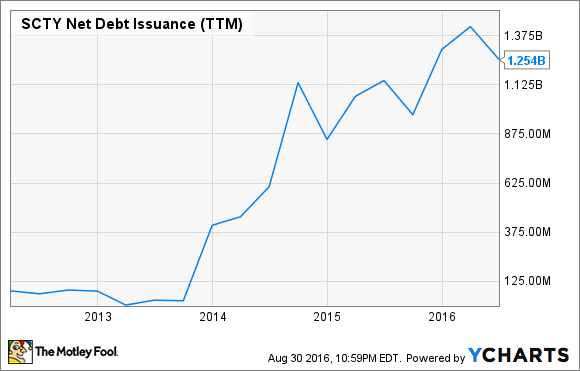 I've previously highlighted how SolarCity's debt costs are rising, and the chart below shows how quickly SolarCity's debt is piling up. SCTY Net Debt Issuance (TTM) data by YCharts. Rising debt costs are bad, but if you're dependent on debt to keep your business running, it can be an absolute disaster. 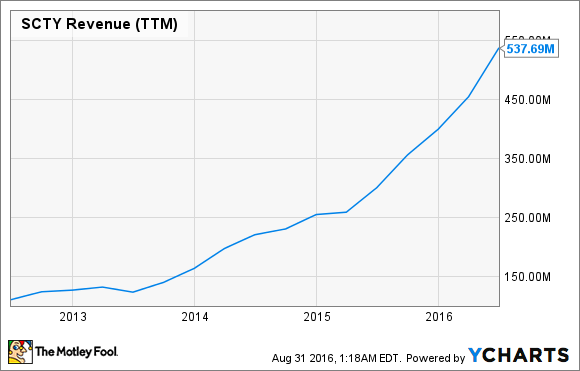 The first chart I showed above was the trajectory of SolarCity's revenue over the last few years. The chart below shows how quickly revenue has grown and is overlaid by how quickly operating costs have grown. SCTY Total Operating Expenses (TTM) data by YCharts. 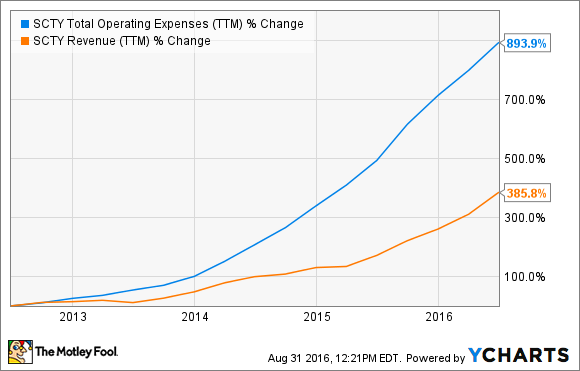 As you can see, operating costs have grown more than twice as quickly as revenue, and those costs will persist if SolarCity's bookings drop, as they have in the past few quarters. Owning the installation and sales process is an expensive business, and that's what's driving operating costs higher. And if the business flounders, it could be a weight that brings the company down.